Sir John Black poses with the first Triumph Mayflower - a car that was very much influenced by his perception of what Americans wanted - hmm! My wife made the mistake of buying me the book A to Z of cars 1945 - 1970 for Christmas 1994 (Michael Sedgewick & Mark Gillies, Bay View Books, ISBN 1-870979-39-7). On page 200 I caught my first sight of the Mayflower and initially thought "What a bloody ugly car!" However, by the New Year I had completely reviewed my opinion and decided to buy one. I joined the Triumph Mayflower Club (TMC) and by June 1995 I had bought my first Mayflower. I am now the TMC Historian and avid Mayflower driver having driven, amongst other trips Land’s End to John O’Groats and to Galway, Ireland from Lincolnshire, UK. The Mayflower has never been the most popular of cars and it has been said that 34,000 were sold only because in the fifties cars, of any type, were in short supply. It is fair to say you either love it or hate it. I love it. Because those that hate it far outnumber those that love it, or even slightly like it, it has sunk beneath the waves of obscurity and rides the crest of ridicule. It appears that by the time the sixties arrived even Standard Triumph were embarrassed by its very production and today there is very little to be found in terms of history or reference material. It is truly Triumphs forgotten car. In 1949 the combined American production of passenger cars was 35.4 million, some 20 per cent more than in 1941. Impressive as these figures are, demand could not be met as car ownership was fast becoming a thing of the masses. One in three owners of 1946 cars, one in four owners of 1947 cars and one in seven owners of 1948 cars would go on to purchase a 1949 or 1950 model. America was an expanding market that the British motor manufacturers had to exploit. Ex-works prices of British cars for export to America were just a few pounds over material costs. On average the cost in labour per car was three or four pounds more than pre-war production. Strikes in the motor industry were common place and wages had virtually doubled to £9. 2s. 6d per week over the war period. The British motor industry was under immense pressure, especially when you consider the types of cars the US was producing at the time! The Labour Government's cry for increased productivity, despite difficulties and shortages of materials and supplies, was supported by the instruction to car manufacturers to go overseas as merchant venturers and become big dollar earners. Import licensing restrictions on goods from 38 designated countries (including Belgium, Luxembourg, Switzerland, and West Germany) with no, or little, risk of the loss of gold or dollars was relaxed for many motor accessory products. This included ashtrays, heaters, door handles, over-riders and bumpers, electric horns, rubber tyres and tubes, mascots, spark plugs (except Areo). The persisting unavailability of high-octane fuels continued to prevent engine designers raising compression ratios to increase economy and power and the positioning of valves was finely balanced between side and over valve engines. The British motorist's attitude to motoring was a "can I get it?" nature in relation to both cars and fuel. Devaluation of the pound from $4.03 to $2.80, as a measure to allow an increase in overseas sales, resulted in fewer cars for home sales and rising prices, although production economies after the launch of a car counteracted this effect to some extent, i.e. less chrome. The tag "available for early delivery" was the norm rather than the once familiar "immediate delivery to home-buyers". The British Motor Trade Association scheme for covenants restricting resale of cars under twelve months old effectively stopped the "rackets in distribution" and reduced the turnover of unused or little used cars. A car under twelve months old could only be sold back to the original dealer who would not pay more than the list price. 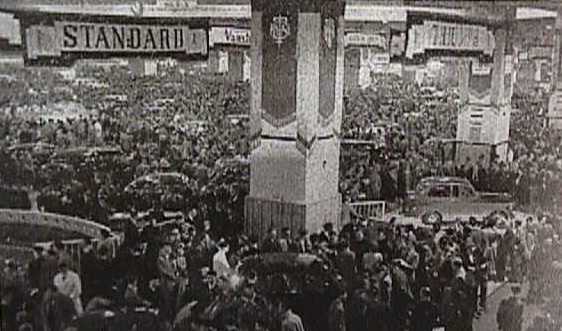 The Thirty-fourth International Motor Exhibition, the second since the war, held at Earls Court, London in October 1949 was less well attended than in previous years with 355,486 paying ten shillings for admission. There was none of the excessive congestion of 1948 (562,000 paying visitors) but attendance was still 50 per cent above the pre -war average. The accessory exhibitors were not giving away the usual nick-knacks and for the first time many of the cars, not including the five star exhibits, were locked to the annoyance of many. The atmosphere was that of a museum - "look, but do not touch". 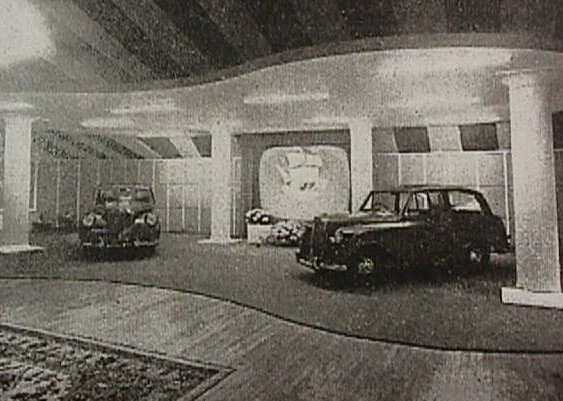 In 1948 there had been numerous novelties at the exhibition with many British manufacturers taking the opportunity to display the results, be it limited, of 10 years of war-interrupted development work. The British motor industry was still smarting from the consequences of pre-war punitive duties (the old RAC horsepower tax) that had restricted imports of foreign cars and therefore stifled the requirement for development, other than for the home market. 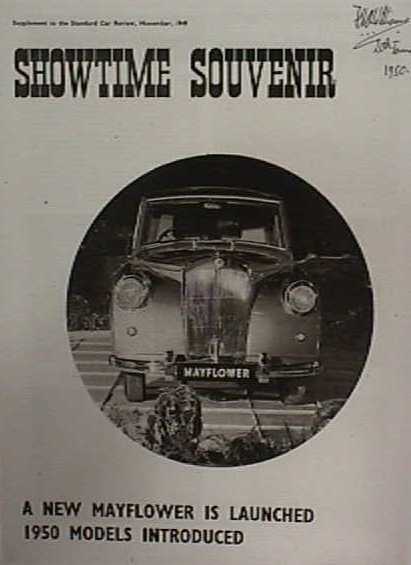 In 1949 virtually all of the exhibits were in production and there were few major innovations - except the Mayflower on its' turntable and the Rover "75", which were themselves based upon existing technology from the parts bin. The galleries and stands also had fewer technical / working exhibits / gadgets - except the Mayflower front suspension displayed on the Alford and Adler stand (above left). On 4, October 1949, Mr L P Lord, Chairman of the Austin Motor Company, said in his opinion a small car was not a necessity at the moment - "We are selling everything that we can make. Nevertheless when the time comes we will produce a small car and I can tell you it will be an Austin Seven." 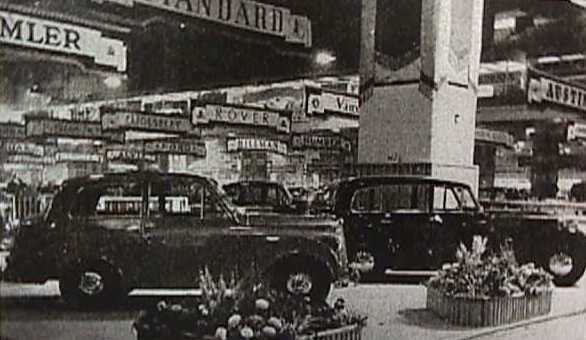 Against this background, Sir John Black, Chairman of the Standard Triumph Motor Company, launched the Mayflower on Stand No 142, costing £473.10s.7d in Vynide and £479.18s.4d in leather. In a speech made on 1, March 1949, Sir John Black had made something of a sensation by predicting that the existing Standard Vanguard and Triumph 2-litre models would be supplemented during that year by the introduction of an entirely new small car. A rumour spread across Europe that an exceedingly cheap 6 horsepower car was planned for the production lines in the Banner Lane factory, Coventry. However, instead of competing with small cheap cars the Mayflower was a notable addition to the ranks of the luxus small car market making an instant appeal to those in search of comfort, full equipment, distinct styling and economical running. The widest discussed feature of the Mayflower was the styling, which was a highly original attempt to combine the two idioms that had previously been considered mutually exclusive. Knife-edged coachwork became popular in the world of large cars with hand-made bodies just before the Hitler-Stalin pact and immediately after the war it was made a production feature of the Triumph 2-litre saloon. The post-war period saw the world of motoring swept by a wave of fashion for the envelope type of body with submerged lamps, integral wings and rounded flowing lines. The Mayflower was a bold attempt to combine the two styles. It is said that Sir John Black insisted on razoredge styling because he had been advised by Louis Antweiller, Managing Director of Mulliners, that Americans loved Rolls Royces. With this seed implanted in Sir Johns' mind it is open to interpretation that he presumed the Americans would be stirred by, and purchase, a miniature version of the Rolls Royce, to wit the Mayflower - later to be dubbed by many 'the watch-charm Rolls'. 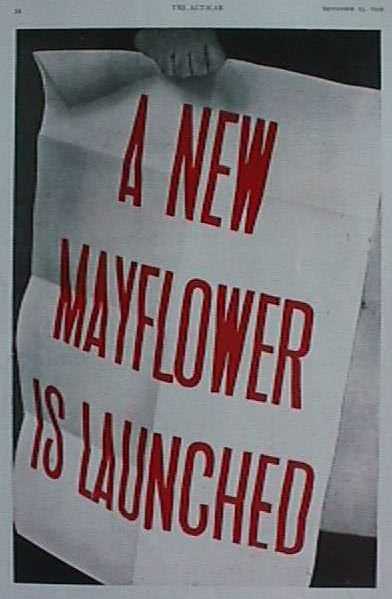 It is further said that Sir John chose the Mayflower name with the intention of appealing to the many Americans who were descendants of the Pilgrim Fathers who had landed in Massachusetts in 1620. There is no evidence to suggest that Sir John, or anyone under his instruction, had visited America or studied the market there. If the foregoing is correct then the inception of the Mayflower must go down as one of the most arrogant, presumptuous and disastrous commercial decisions made by any person during the twentieth century intending to enter the volume American motor market. Indeed, more Mayflowers were shipped to the then Ceylon (Sri Lanka). Vic Hammond (Chief Stylist and Body Engineer, Standard Triumph 1955 - 1960) told me; "Sir John Black gave Lesley Moore of Mulliners (of Bordesley Breen, Birmingham and not H.J Mulliner of Northampton) the brief to design a 10hp car. After a week or so of little apparent progress Ted Grinham was sent to Mulliners to give a rollicking to all concerned. Lesley Moore came up with the basic design for the Mayflower and Walter Belgrove (then Chief Stylist and Body Engineer at Standard Triumph) created a clay model from Moore's design - there was no plywood mock up. I designed the radiator grille and front bumper and Les Island designed the fascia. I made up the first working drawings for the Mayflower and Arthur Ballard created the first prototype, mostly on existing mechanicals, with help from Jim Percival, Director of Engineering at Fischer Ludlow." The Triumph Mayflower was unveiled to invited members of the Technical Press and the Company's Distributors on the 23 October 1949 in a specially decorated section of the main canteen at the Banner Lane factory. Two Mayflowers and an oval dining table centered by an approximately four foot high model of the Mayflower sailing ship were the center of attraction (left and below). Sir John welcomed the guests and gave a report on the Standard Triumph Company's performance over the previous twelve months referring to the Mayflower and Standard Vanguard on numerous occasions. The press gave the following reactions. Upon seeing the brand new Triumph Mayflower at the Earls Court Motor Show an unknown woman was heard to comment: "Oh, how perfectly bloody"
Unknown source: "The Watch Charm Rolls" and "Slab Sided Tobacco Can"
Tom Cahill of the American magazine Mechanix Illustrated: "Like a teen age kids beard, it was slow in growing but nevertheless this car was growing on me. Even the knife-edge body treatment got less hard to take ... this slightly stuffy look, at first glance silly, soon gave it a sort of aloof Country Club appearance." The Autocar, Road Test 1950: "The style really is no more than incidental to a solid purpose, which is to give not only room by measurement, but also room to breathe by virtue of an increased volumetric capacity of enclosed air, and a feeling of cheerfulness and brightness by reason of large window areas and thin pillars." If you want rapid acceleration, speed and sure-footed road holding then the Mayflower is not for you! It was intended to be a family car not a sports model. However, if you want to drive a car that is fun and that rewards the intelligent driver the Mayflower could be for you! It must be said that the 1277cc 10hp side valve engine, developing 38bhp at 4200 rpm, is not really up to the job and is best described as a 'slogging motor' that pulls well. It was developed from the Standard Flying 10 engine whose reliability and smoothness is legendary and made production sense in the post war austerity years. However, if you are content with cruising at 50-55mph all day with the minimum of need to change through the three-speed column shift gearbox this should not bother you (first gear is only needed when starting from rest). Driven intelligently the Mayflower copes well with today's driving conditions on 'A' roads in the UK. The gearbox is virtually indestructible, though a little awkward at first to master. The art is to ease the gears in slowly and deliberately. On runs an average 41-mph is easily attainable. The body roll can be quite dramatic if you approach a corner at speed. This can catch out the novice Mayflower driver. However, once experienced this is never forgotten or repeated! I find the ride acceptable and have driven 410 miles in one go without the need to stop – except for fuel and food. I’ve driven from Northern Lincolnshire in England all over the UK, including Land’s End to John O’Groats, Ireland and Belgium. The driving position is good (I'm 6' 1") and visibility is excellent. Leg-room, front and rear, is better than in many modern cars I have owned. I would like to fit front seat belts for front passenger safety, and mine, as I have in the rear for the kids, but this is not possible without major structural works, if at all. This may be the greatest factor determining if the Mayflower is for you! The Mayflower is comfortably furnished and equipped, most having leather seats and carpets, though others have Vynide covers and rubber matting (rare to find complete). There are oil pressure and water temperature gauges to accompany the speedometer. Pre 1951 models have a trip and wind up clock in the speedometer. There are parcel shelves either side of the central black Bakerlite dash, a rear parcel shelf and pockets for the rear passengers. The dash is lit for night driving and there is an internal cabin light. The luggage boot has a bottom hinged lid that acts as a platform for larger items with drop down number plate holder. The boot is more than adequate to cater for a family day out or weekend trip. The spare wheel is held in a secure cradle beneath the boot / petrol tank which holds 10 imperial gallons. To date I have had no problems locating spares myself (in the UK), or through the TMC, as the mechanics are shared with other more numerous / popular classics e.g. 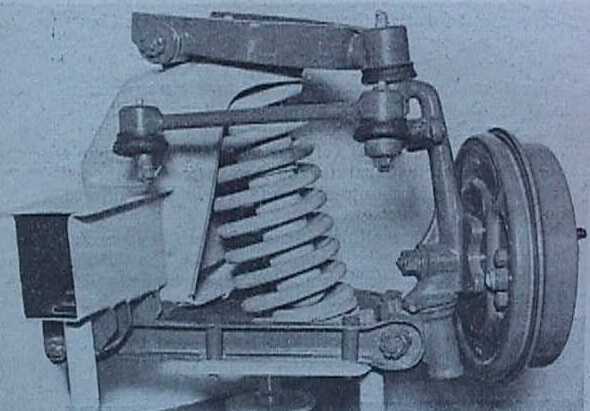 Lockheed brakes are same as the Morris 1000 and master cylinder on forklift trucks. The Lucas electrical system is easily catered for, though distributors are not common. The main items that can cause problems are interior trim, body panels and the removal of the aluminium head seized to the steel studs (an extraction tool may be hired from the TMC.) I have found a 'new' front wing and interior items so they are still out there! New sills have been remanufactured. TMC members, like myself, generally hold their own stock of spares to compliment that of the club and help out in times of crisis. The mechanics are generally bullet proof and are relatively easy to work on, though the tappets are a so and so of a job!. The body is simple enough to repair and to weld in 'new' panels etc. Servicing is simple but certain things come around all too quickly (500 mile intervals). Cost of servicing is minimal. I achieve, on average, 28mpg and a pint of oil per 1,000 miles. When there is no salt on the roads I use my Mayflower on a daily basis for both work and social activities. Reliability is not a problem. The Mayflower's floor pan was welded onto the 'chassis' frame, and in both cases the thick metal used is normally resistant to rust. Nevertheless, start your inspection by checking under the car for rust about the outriggers / main 'chassis' beams as severe rust will result in much work and cost. There is a built in dirt trap at the bottom ends of the front wings which allow rust to work its' way backwards into the door pillars and sills. The offending panel usually has to be removed by drilling out the self tapping screws and refabrication of the same. The sills are not structural and are a remanufactured item. Examine the inner wings (especially the front), the boot floor, bottom of the boot lid and bottoms of doors. The engine is a reliable unit but will easily overheat if the ageing radiator is clogged. Anti-freeze with a corrosion inhibitor should be used all year round to protect the aluminium cylinder head from internal corrosion and seizing on the steel studs. Mayflowers can suffer from fuel vapour lock when hot which is made worse by a worn fuel pump. Check that the steering isn't too vague as it's expensive to rebuild the steering box. Also check that the top rear retaining bolt for the steering box mounting isn't missing! Condition 3 (complete car, rough / non-runner) - free up to £250, Condition 2 (average condition with some work needed) - £2,500, Condition 1 (mint) - £3,500. It is possible to restore / run a Mayflower on your own but you are well advised to join the TMC which is a friendly Club run by members for members. I have bought two Mayflowers through the club and have had much technical assistance when in difficulty. The Triumph Mayflower became a rare sight on British roads after the 1960's, and in 1974 two owners in Bristol, England started the Triumph Mayflower Club in the hope of uniting those with a common interest in the car. In a short time owners from all over the United kingdom were joining and as knowledge of the club's existence spread, applications were received from the U.S.A., Canada, Australia, New Zealand, Japan and most of the European countries. During the first four years, over three hundred members enrolled, and their efforts are now bearing fruit as each year more restored Mayflowers take to the road all over the world. The TMC adopted its constitution in 1978, which regulates its activities, and has gone from strength to strength. Large stocks of parts are held by the TMC and are available to members only at reasonable prices as the TMC is none profit making. It is hoped that eventually all mechanical parts will be held to keep Mayflowers on the road (where they belong). Some surviving stocks of original parts have been found by members to complement the second hand and remanufactured parts held. Recently the endeavours of an American member resulted in the remanufacture of all four quarter light rubbers. It is an expensive and time consuming business locating spares and the TMC's members play their part admirably. Spares are not the TMC's only concern; a quarterly magazine 'Flowerpower' is produced in house and sent to all members. This contains articles of both a technical and historical interest, as well as being a vehicle for all members to pass on advice, seek assistance and buy and sell items Mayflower. From time to time lists of members are published so as to allow members to contact each other and provide help and support. To enable members to meet, with or without a Mayflower, the TMC, often in conjunction with other TRIUMPH clubs, holds an annual rally. In an attempt to appeal to all members and their families every effort is made to hold the rally in a central location of England at a venue offering more than just cars to see. 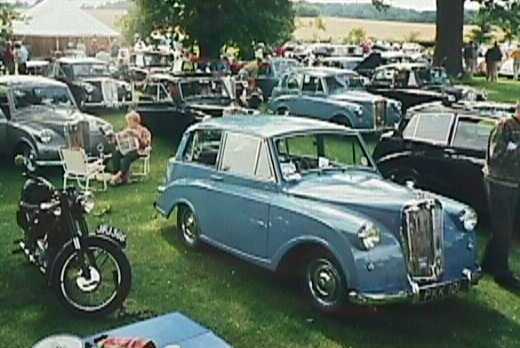 The TMC co-operates with and is affiliated to other Standard and Triumph clubs. Because of the widely dispersed membership, it is not possible to organise local meetings on a regular basis. However, there are Southern and Northern meetings in the UK and an Annual General Meeting. The AGM is held at the end of March, is open to all members, and promotes member participation at all levels of the club. Any member can stand on the committee or express a view on the clubs activities. The TMC is run by members for members to ensure the continued existence of the Mayflower on the roads of the World. You do not have to own a Mayflower to join the club. It is open to anyone interested in an important, if sometimes overlooked, part of British motoring history. ©2001 - 2012 TRIUMPH MAYFLOWER HISTORIAN. All rights reserved. You may not copy or distribute photographs or information from this site without prior written permission. Information is believed to be accurate, however due to the many and dynamic sources I do not warrant the validity of facts, dates, availability or other information shown here. Please confirm dates and venues of any event mentioned before you travel.